Secret Policeman’s Ball This Week! We’re in Committee Room 1 in the QMU at 5pm. It’s on the third floor and if you’re lost we’ll have some Amnesty folk in the foyer to direct you! We’ll continue looking at the arms trade, and start watching Lord of War, and Amnesty endorsed film about the trade. We’ll also get tickets sorted for The Secret Policeman’s Ball (which is this Saturday- eek!). If you took tickets away, please try to bring in the money to tomorrow’s meeting! If you have some spares, bring them back in, or if you can still sell some please keep them! – The Secret Policeman’s Ball 2012: THIS SATURDAY 4th February, 7:30pm. Our annual night of stand-up comedy and sketches is almost upon us! Loads of you having been working hard on this selling tickets, flyering, postering etc, and it’s the final push this week. If you haven’t got a ticket yet, do snap one up asap as they are selling faster now: here’s the online booking link: http://www.wegottickets.com/event/150821, and here’s the Facebook event page: http://www.facebook.com/#!/events/195138300581324/. You can also buy tickets from the QMU box office! 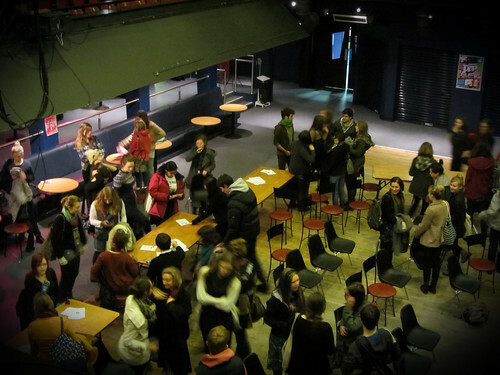 – Arms Trade Treaty event with Amnesty Scotland: Monday 13th February: We’re in the planning stages of an event with Amnesty Scotland raising awareness about the Arms Trade treaty. At the moment we’re planning on having a few speakers, a debate and some interviews; as I get the details I’ll let you know! In the meantime follow this link for background information: http://www.amnesty.org.uk/content.asp?CategoryID=10079. I’ll see you all tomorrow at the meeting or on Saturday at the ball! Hope you have all had a good start to your week. This week’s meeting is on Tuesday (tomorrow! ), at 5pm in QUDOS in the QMU. We’ll be talking about the Arms Trade and taking a couple of actions, as well as continuing to prepare and plan the Secret Policeman’s Ball. And you can also buy them at the QMU box office! – Cake stall this Friday: We’re running a cake stall on Friday to drum up some publicity for the Ball. We’ll sort out a rota at the meeting tomorrow. Ticket info: If you have a bunch of friends you want to sell tickets to you can grab some tomorrow. If you took some away last week and have money please bring it tomorrow or next week- thanks! We really rely on the enthusiasm of members to guarantee the success of the event, so keep plugging it to everyone you know! 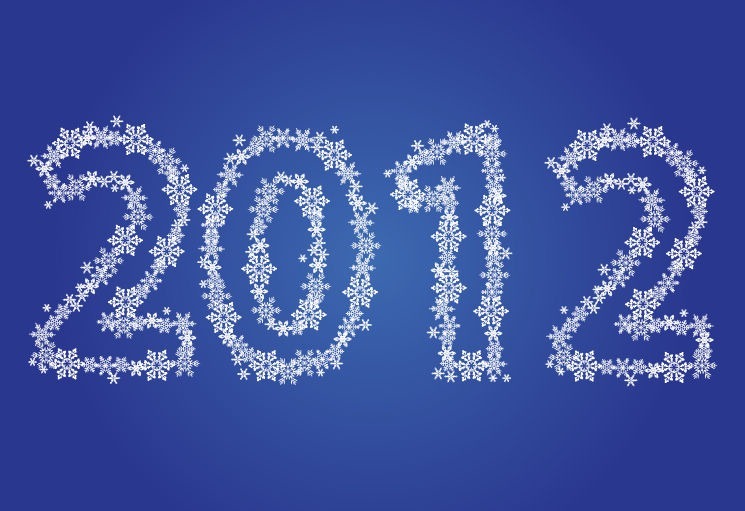 Second Meeting of 2012 and Update! Sorry this mailing is a day late! Thanks to those who came to the pub quiz with Mary’s Meals last night – we had a great turnout! Hope you had fun! I’ll let you know how much money has been raised when it’s all counted up. This week we are back in Qudos in the QMU, 5pm, Tuesday. We’ll continue to focus on Guantanamo Bay, then for some encouragement take a look at some Amnesty success stories over the last few months! If you’re new this semester, we’ll have a table dedicated to introducing the charity and society. As well as this, we’ll crack on with Secret Policeman’s Ball planning! 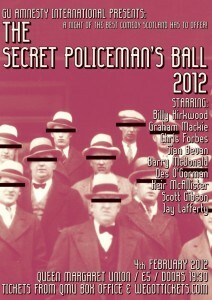 THE SECRET POLICEMAN’S BALL 2012, Saturday 4th February: Our biggest event of the year is less than three weeks away! If you’ve not heard of it, this is a night of stand-up comedy and sketches all hosted by the brilliant Billy Kirkwood- keep your eyes peeled for posters up around campus and in the QMU. Tickets are only £5 and are available from the QMU box office and online at http://www.wegottickets.com/event/150821: snap ’em up! Last week we had loads of people offering to help- thanks so much! We have thousands of fliers arriving this week so we need plenty more people to scatter them around Glasgow. Here’s the event page for more info: http://www.facebook.com/events/195138300581324/. We also want to hold a bake sale to help promote The Secret Policeman’s Ball and a Guantanamo campaign on campus, but we’ll discuss that tomorrow and I’ll send you more details if you can’t make it to the meeting. Hello lovely people of Amnesty! I hope your Christmas and New Year was delightful! Our first meeting of the new semester is at 5pm in Qudos in the QMU on Tuesday (10th). So our fundraising total for first semester is an amazing £884.67!! Well done everyone! Same again (plus more) this semester! Our End the Death Penalty campaign took place on World Day Against the Death Penalty (10th Oct): we stood on the library hill holding signs labelled with methods of execution and with prisoners on death row, with a table of information and petitions outside the library. ‘I am Troy Davis’ march: members went to Edinburgh to take part in this march both in solidarity with the Davis family after the execution of Troy, and in opposition of the death penalty. Our Stop Stoning campaign saw us on library hill again, standing with large cut-out letters spelling ‘stop stoning’. In two hours, we collected a brilliant 458 signatures opposing stoning in Iran. As well as all this, we went to several film screenings including ’62 Years Later’, ‘Burma VJ’, ‘The Stoning of Soraya M’ and Christian Aid’s (in association with The Guardian) ‘Food and agriculture: Land ownership in Ethiopia’. Thank you everyone for all your enthusiasm, commitment and hard work last semester- we did loads! The first few weeks back are going to be extremely busy! In our first meeting we’ll talk about what campaigns we want to focus on this semester, allocate jobs that need doing for the pub quiz and the Secret Policeman’s Ball (see below), as well as eating buns and catching up. PUB QUIZ with Mary’s Meals, Sunday 15th January, Jim’s Bar, QMU, 8pm, £2: Our first event of 2012 is alongside the wonderful Mary’s Meals! To check out the charity follow this link: www.marysmeals.org . We’re hosting a pub quiz with PRIZES up for grabs and a raffle with MORE PRIZES to be won! Come along for a fun-filled evening of trivia, drinks and PRIZES all in aid of two great causes! Here’s the Facebook event page: http://www.facebook.com/events/223220054422032/. Come along! THE SECRET POLICEMAN’S BALL 2012, Saturday 4th February, Qudos, QMU, 7:30pm, £5: Our fourth annual night (and our biggest event of the year) from some of the best Scottish comedians is only a month away! The ticket website and the Facebook group are set up, but we need decorators, posterers, leafleters, writers, photographers, raffle prize collectors, ticket sellers, PRs, Powerpoint makers, banner makers, people with lots of friends and a lot of enthusiasm! If you want to be involved- we need you! This night has been successful for the past three years and we want to make this the best yet and raise a lot of money and awareness. On Tuesday’s meeting we’ll get some committees set-up (raffle, publicity, etc). Here the Facebook event page- invite your friends and yourself! http://www.facebook.com/events/195138300581324/ , and here’s the link to the ticket website: http://www.wegottickets.com/event/150821. If you’ve never been before, now is the perfect time to come along! Newcomers are more than welcome. Also looking forward to seeing some familiar faces, too! See you on Tuesday at 5pm in Qudos, QMU! The Secret Policeman’s Ball is back! On Saturday the 4th of February Glasgow University Amnesty International are hosting their fourth annual SPB: an award winning night of the best comedy Scotland has to offer. We’re delighted to announce that double Bafta Award winning comedian Billy Kirkwood is back to compere for the fourth year running. Also giving you a lot to laugh about this year are: Graham Mackie, Chris Forbes, Sian Bevan, Barry McDonald, Des O’Gorman, Keir McAlister, Scott Gibson, and Jay Lafferty. With a line up comprised of some of the best comedy talent in Scotland you barely need another reason to attend. But of course we’ve got one. The Secret Policeman’s Ball is a student-run benefit show being held in aid of Amnesty International. The work that Amnesty International does is vital in the fight against human rights abuses, and the positive impact that their work has is felt by individuals all over the world. So join us for a night of comedy, laughter and high-jinks that’ll give you something to feel good about long after the show is over!